IntelliTrak is a proud supporter of the LICO foundation. The LICO Foundation exists to utilize company talents and resources for the betterment of our communities – Kansas City, Southeast Michigan, and the Cincinnati area. 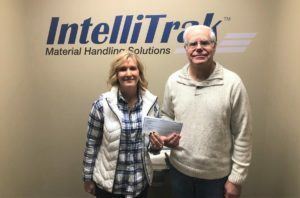 IntelliTrak received its first grant from the LICO Foundation on January 8, 2019.
and proudly presented a check for $2,500 to Wayne Krieghoff, Trustee for the Fairfield Food Pantry on January 23, 1019. The Fairfield Food Pantry, established in 1996 with a mission “to provide a balanced and nutritious emergency food supply to those in need”, is a great example of an organization working for the betterment of the local Fairfield community.